I asked Carmelo Anthony a question on the lack of media coverage on Puerto Rico following Hurricane Maria and this is his response (around 11:37 on the video). I urge my readers, whatever you can donate or give, please do. There 3.5 million AMERICANS that need your assistance on the island. Have you ever started watching a movie thinking it was your first time watching it. But then halfway through, you realize you’ve either already seen the movie before or have caught parts of it playing somewhere else? It’s happened to me plenty of times. Someone suggests a movie to me and I find on Netflix or RedBox and start watching it. Then I realize that I’ve seen parts of the movie playing on USA or TNT on a slow weekend afternoon in the past. 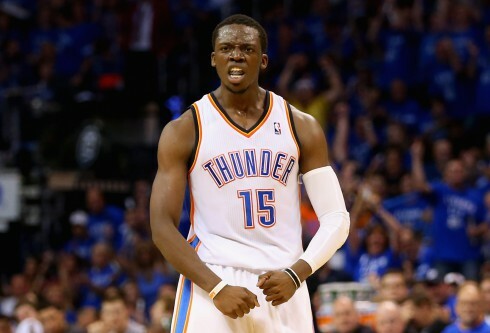 The Reggie Jackson situation with the Oklahoma City Thunder has caused me to seek a comparable situation. Everybody always wants to rush to the Jackson:James Harden comparison. A great 6th man combo guard with the talent and skill set to start in the NBA, but in a situation that doesn’t allow him to be a consistent starter on his current team. Also, in both situations, the players were coming up on their first contract extensions. With Harden, Thunder coach Scott Brooks felt more comfortable with Harden coming off the bench and liked the defensive presence Thabo Sefolosha provided in the starting line-up. With Jackson, the situation is more positional. When you have one of the top 10 players in the world ahead of you on the depth chart, there’s not much you can do other than waiting (wishing, hoping) for an injury to occur. Not saying that Jackson would do that. With the same coach and coaching philosophies in tow, the off-guard position was given to another perimeter defender in Andre Roberson. Jackson, like Harden before him, wants to be a starter in the league. And like Harden, Jackson wants to get paid his market value. But that is where the similarities ends. Say what you will about the Harden trade, but recent leaked stories have confirmed the trade had as much to do with the finances and future flexibility of the team as it did with Harden wanting a bigger role (either on the Thunder or on another team). With the Thunder unable to promise Harden a bigger role (likely as a starter), and with the possibility of Harden getting, not only a max deal, but a super max deal from another team, the wheels were put into motion to get the trade done. If the Thunder would have been willing to promise Harden the bigger role and possibly a max or near max contract, there’s no telling whether Harden would still be wearing a Thunder jersey. That is not the situation with Jackson. Russell Westbrook is one of the top point guards in the league. There is no way, barring injuries, of course, that Jackson is going to supplant Westbrook for that position on the team. And the team’s philosophy of having a defender/normal sized SG next to Westbrook kind of negates the possibility of Jackson consistently starting for the team. So where does that leave Jackson? He sees himself as a starter in this league, but doesn’t have a starting spot on this team to aim towards. He knows that his body of work up to this point almost guarantees him a sizable contract. He knows that he has a place as a starter and a nice contract coming up somewhere other than Oklahoma City. So then why does it seem like he is dogging it this season? The answer may lie in the only player whose situation compares to Jackson’s more than Harden. In the 2011 NBA playoffs, the Thunder made a surprising run all the way to the Western Conference Finals. The No. 1 seeded Spurs were upset by the upstart Grizzlies in the first round, and the No. 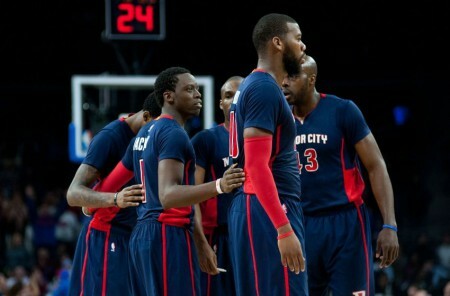 4 seeded Thunder won their first playoff series, defeating the Denver Nuggets 4-1. This set-up an epic 7-game series with the Grizzlies in the 2nd round. After a back and forth series, Russell Westbrook’s triple-double in Game 7 proved to be too much for Memphis as the Thunder rolled into the Western Conference Finals. Awaiting them in the 3rd round was the veteran Dallas Mavericks. The experienced Mavericks went on to defeat the Thunder 4-1 in the Western Conference Finals. That much was expected. Experience usually trumps naivete. What wasn’t expected was how the Thunder won their only game in the series. 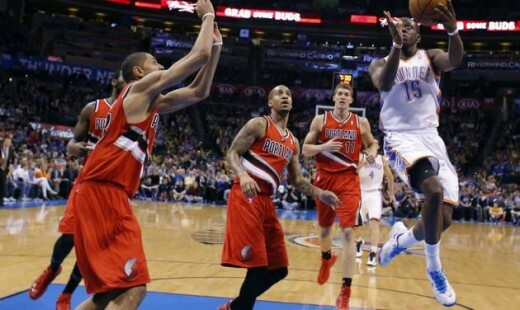 In Game 2, the Thunder were nursing a 1 point lead heading into the fourth quarter. Thunder coach Scott Brooks substituted Eric Maynor in for Westbrook for the last 32 seconds of the third quarter, in what was Westbrook’s normal rest time in the 2nd half. Up to that point, Westbrook had played a typical Westbrook game: 18 points on 7-15 shooting, 3 rebounds, 4 assists, and 4 turnovers. He was a bit erratic defensively, but really, it was a game that was par for the course for Westbrook. In the 4th quarter though, Eric Maynor, along with the rest of the bench mob (James Harden, Nick Collison, and Daequan Cook) teamed up with Kevin Durant to hold on to that one point lead and win the game by 6. The talk after the game was not of how Durant led the team to victory, but of how Maynor controlled the flow of the game in that 4th quarter and made the right plays almost every time down the floor. When the season ended for the Thunder, there was an excitement for the future of the team. They had a developing nucleus, not just in the starting line-up, but also on the bench. Maynor was getting lauded with talk of being “the best back-up point guard in the league,” and “a young, up and coming floor general”. With all that talk, the Thunder knew they had an asset on their hand. 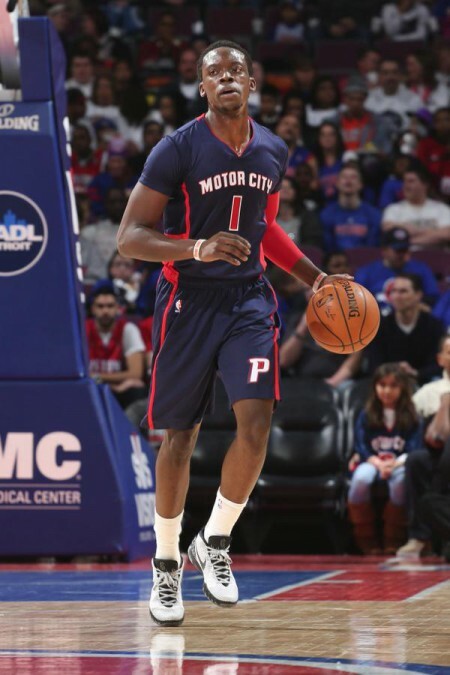 They drafted a developmental point guard by the name of Reggie Jackson in that year’s draft in hopes that Jackson would eventually replace Maynor on the bench. 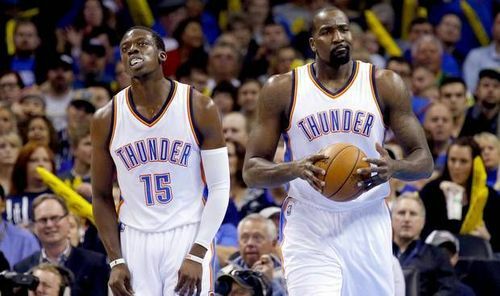 The Thunder knew their core was Durant, Westbrook, Harden, and Serge Ibaka. Anything past those four players was considered an asset to be flipped. 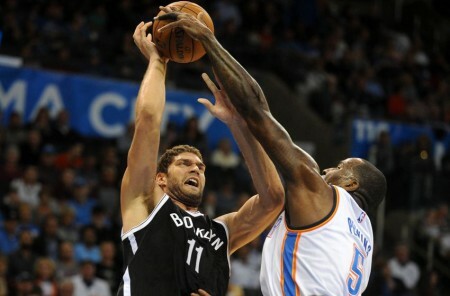 As the Thunder entered the next season, the word title contender was being tossed around. 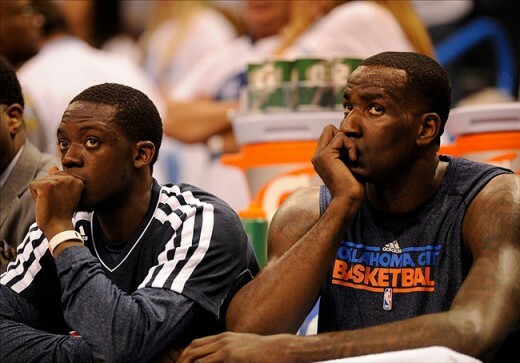 One of the reasons for that thought was the strong bench the Thunder brought into every game. Nine games into the season though, in a game in Houston, Maynor drove to the basket in the 4th quarter when his knee buckled. 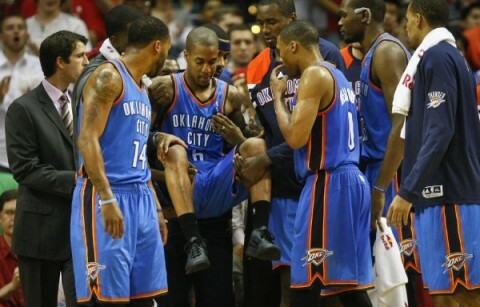 He went down in a heap and had to be carried off the court. A day later he learned his fate: a torn ACL that would keep him out the rest of the season. After the injury, Maynor was never the same. His game suffered as the little bit of athleticism that he had was sapped by the injury. He struggled to recover and eventually lost his back-up job to Jackson. As the season wore on, the inevitable became more and more clear: Eric Maynor was no longer a part of the Thunder’s future. They evetually traded him to the Portland Trailblazers at the trade deadline for a Traded Player Exception and the rights to Greek player Georgios Printezis. In all likelihood, the injury probably cost Maynor tens of millions of dollars. Within two years of the injury, Maynor was out of the league. Fast forward to the end of last season. Jackson had a great regular season as a starter for Westbrook when he was out for almost half the season and as a 6th man when Westbrook returned. 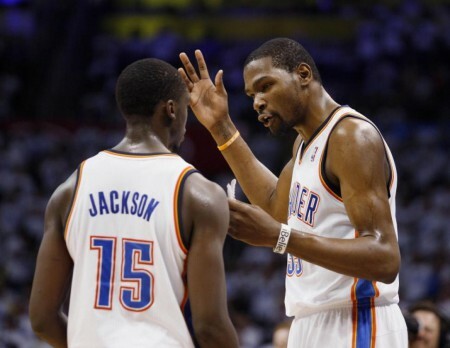 Then in the playoffs, Jackson single-handedly won what was basically an elimation game for the Thunder in Game 4 of their first round series against the Grizzlies. In the West Conference Finals, Jackson started in place of an ineffective Sefolosha for the final four games of the series. After the season, Jackson was anointed with the tags “best back-up point guard in the league” and “could probably start for 10-12 teams right now.” It seemed like deja vu for the Thunder all over again. Except this time, the team actually wanted to keep their back-up point guard. To this day, though, Jackson has not reciprocated that same feeling towards the Thunder. Now, the player that took over for Maynor two years ago, is likely hoping to avoid the same fate that befell his predecessor. Players learn from experiences and think about their futures just like you and I think about ours. That their futures include a couple more zeroes on their paychecks than ours do is inconsequential. Athletes know that their worth is only as good as their product (play/health). If the health aspect of that goes away, then the player is viewed as a risky asset, which usually means much less money. So while it doesn’t necessarily excuse Jackson’s play of late, I do understand where he may be coming from. We talk about athletes all the time like they’re robots, but in reality, these guys are humans that pessimistically think about their futures just like you or I.